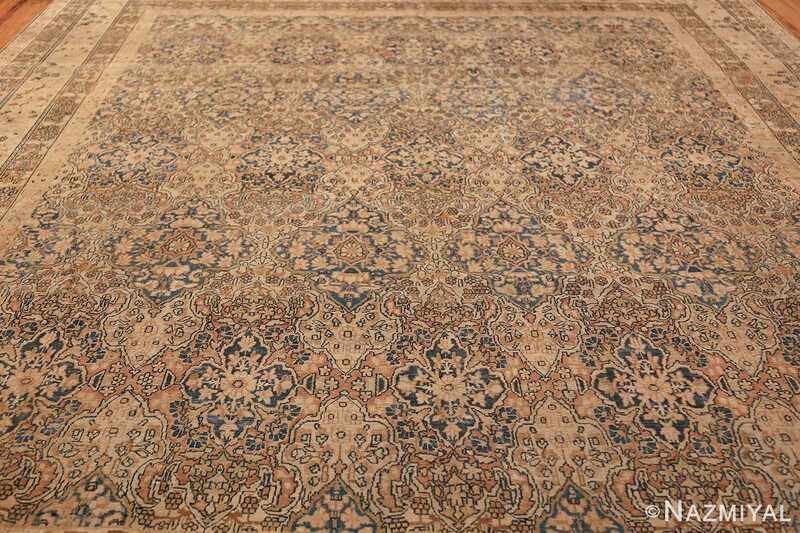 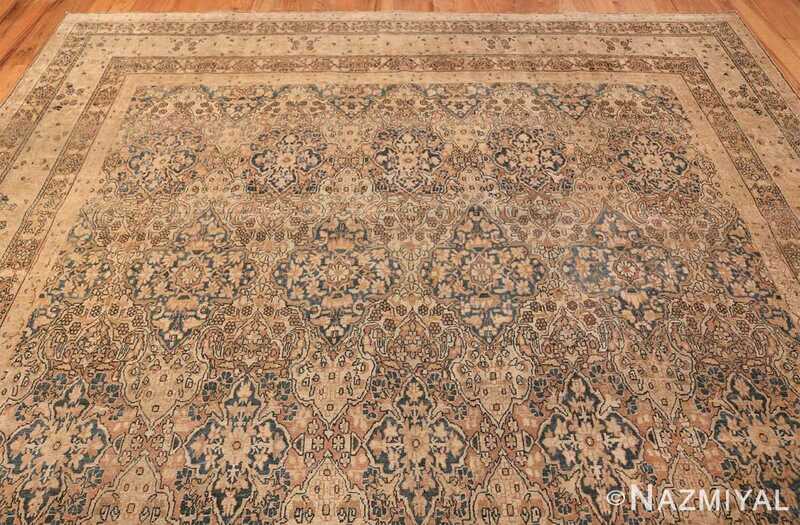 Woven in the Kerman style, this elegant carpet features a tessellating latticework pattern woven in a stunning combination of oxidized Persian blue, camel and golden-brown. Beautiful Decorative and Finely Woven Antique Room Size Persian Kerman Rug, Country of Origin: Persia, Circa Date: late 19th century – This antique Persian rug is an undeniable masterpiece. 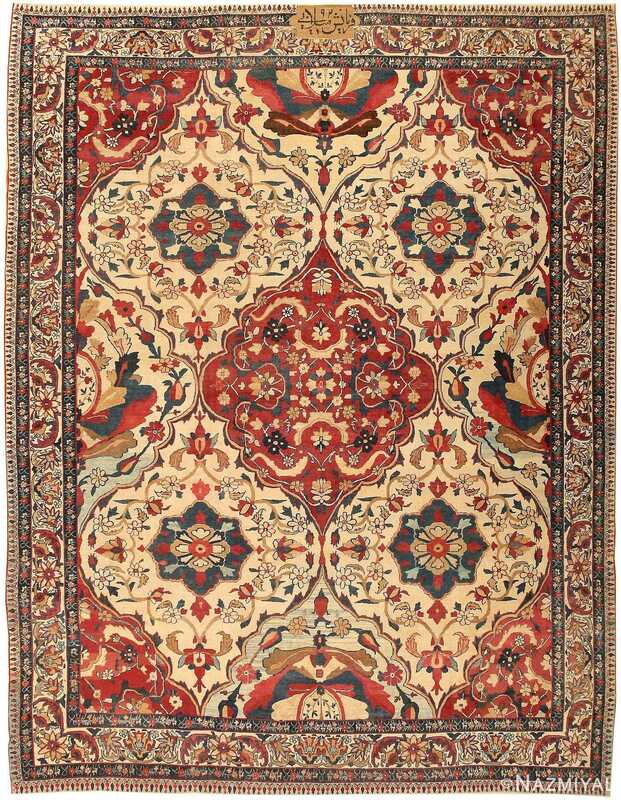 Woven in an authentic Persian style, this highly decorative antique Persian Kerman rug provides a kaleidoscope of beauty for the beholder. 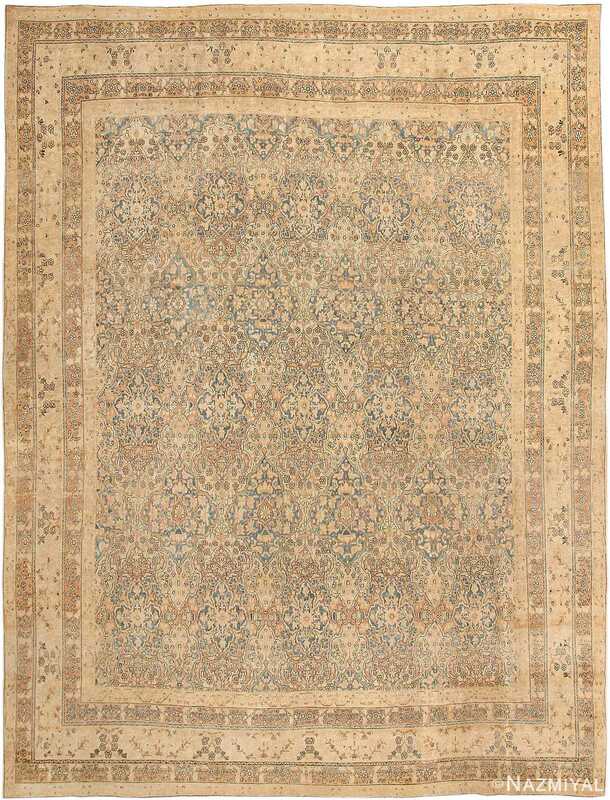 The color scheme is subdued and calming to the eye. 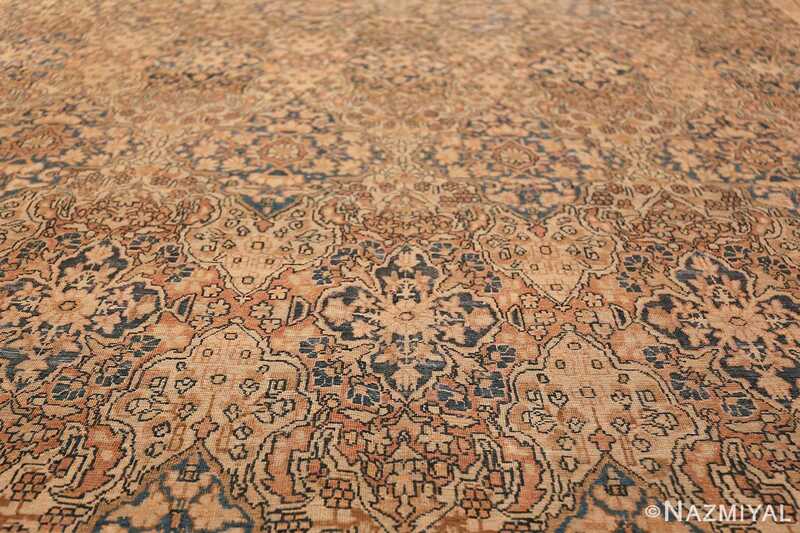 In masterful fashion, different shades of brown, tan, and gold interact with one other to create a complex yet soothing pattern. 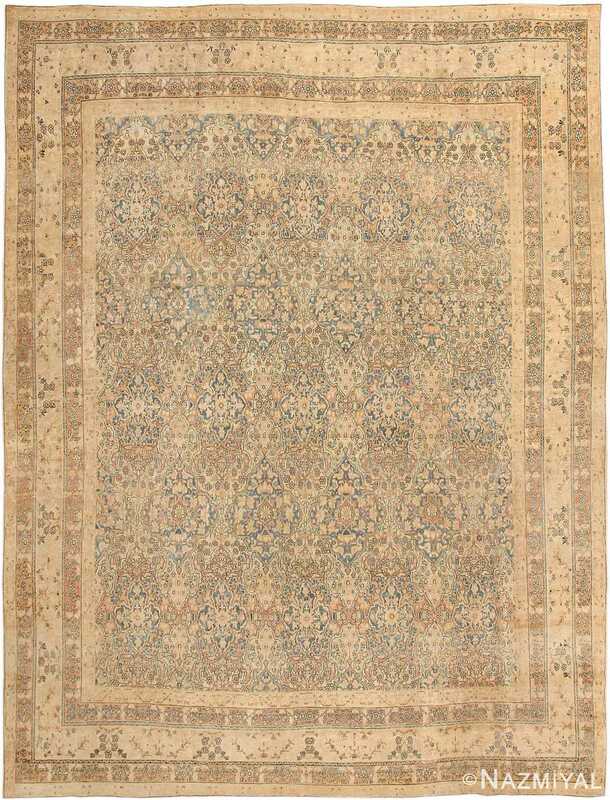 The soft brown tones of this magnificent room size rug are set off by glimmers of blue – both subtle and brilliant. 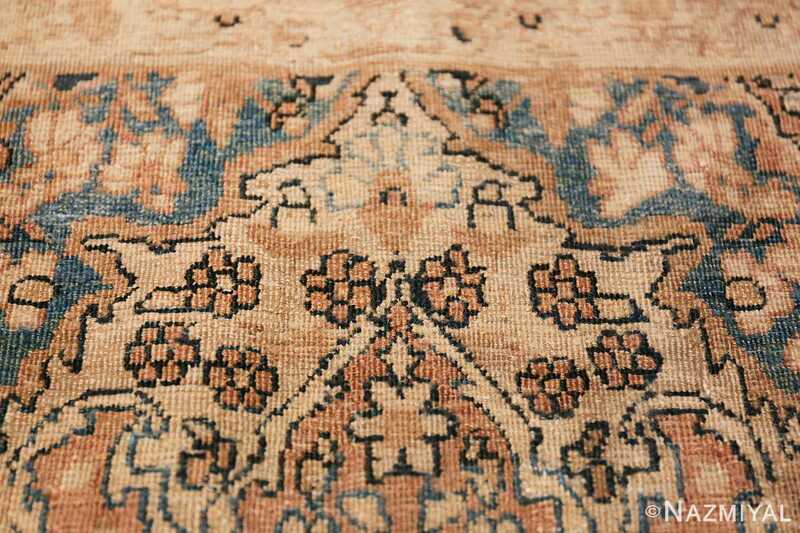 The border of this antique room size Persian Kerman rug is formed by rows of tiny, intricate patterns, which alternate with larger designs. 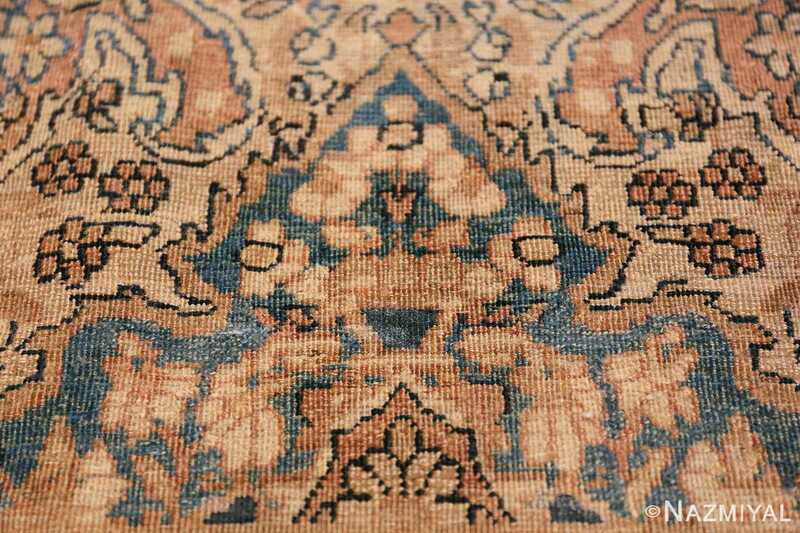 These motifs picture leaves, flowers, and branches. 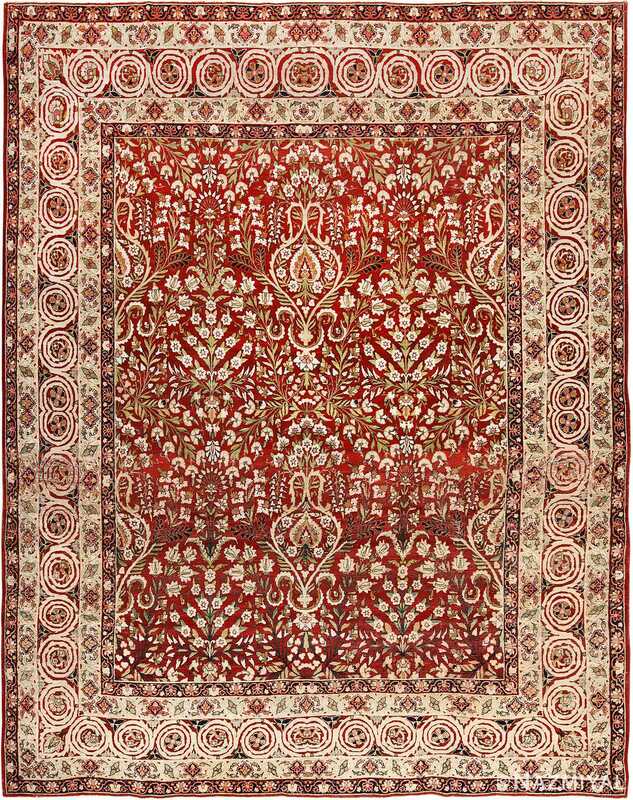 The freedom of these patterns is evident, calling to mind the movement of plants in a flower garden on a windy day. 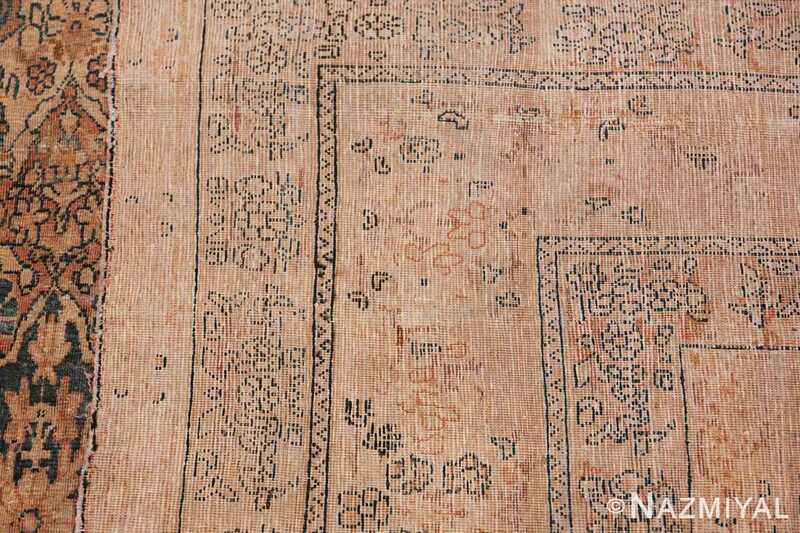 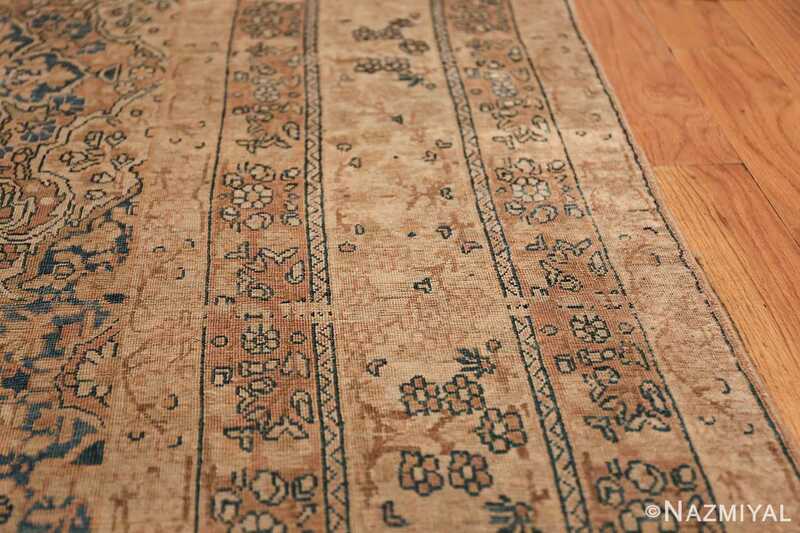 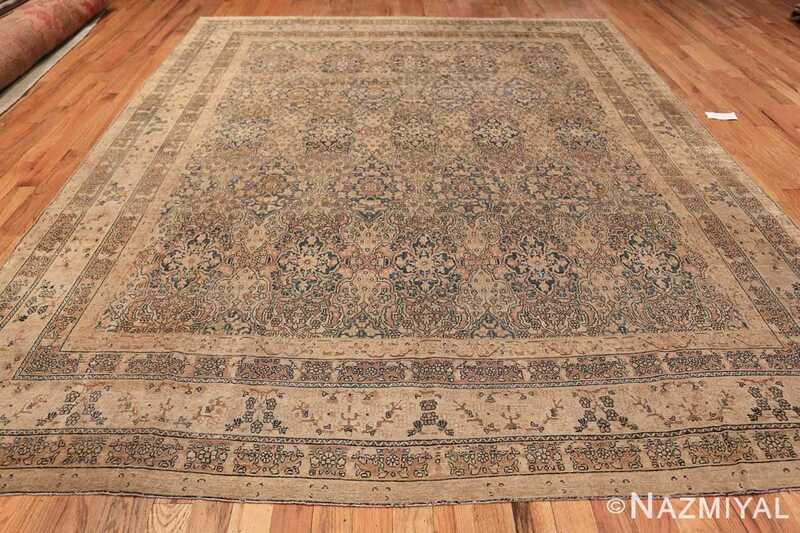 The smaller patterns in this antique Oriental rug are woven closely and with more detail than the larger patterns. 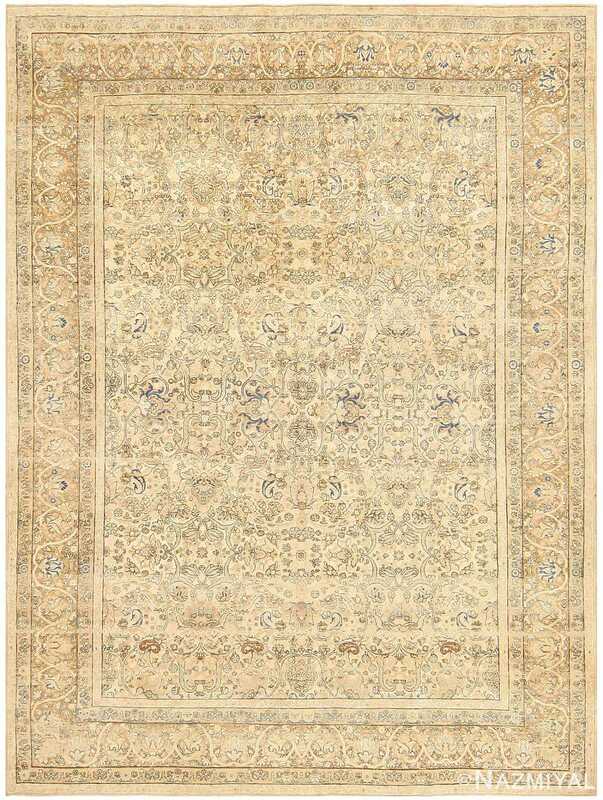 The larger patterns themselves appear to be scattered across the background of the rug with a joyful spontaneity. 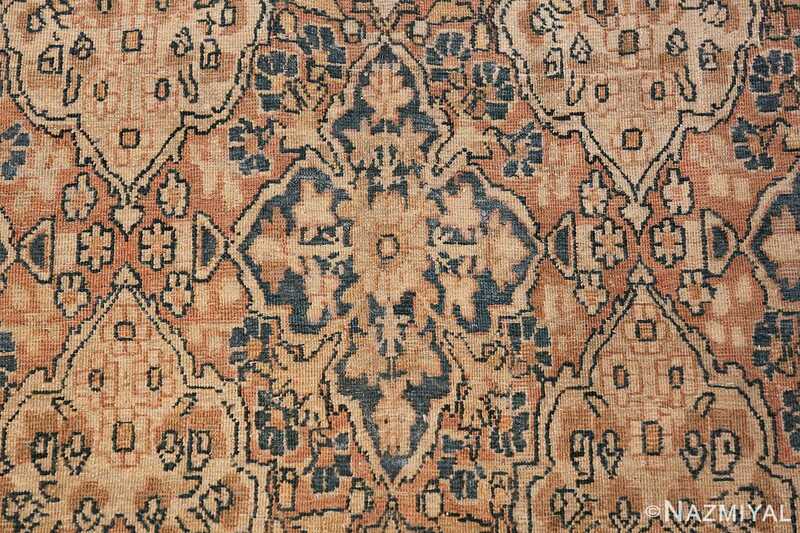 These alternating borders lead to the center of the rug, where a new pattern is introduced. 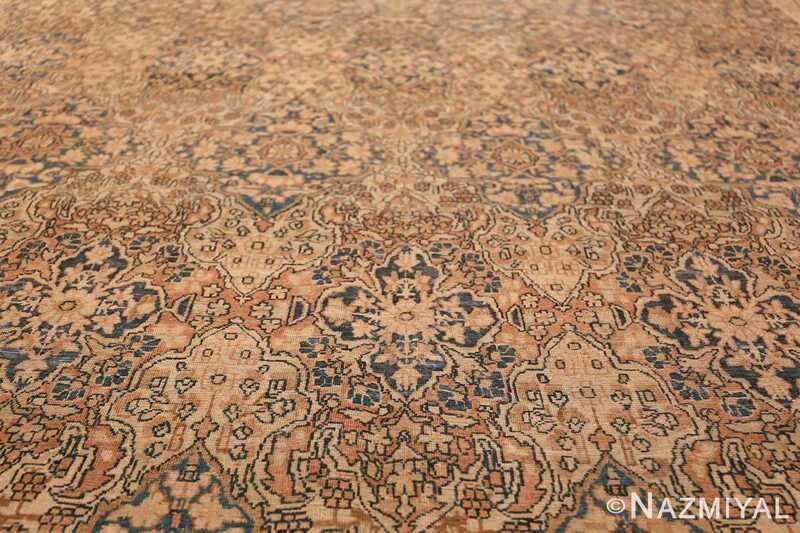 The largest portion of the antique room size Persian Kerman rug – the center – displays an elaborate lattice-like pattern. The intricacy of the rug weave is especially incredible in this section. While an obvious interior design is evident from a distance, smaller designs appear with closer scrutiny. 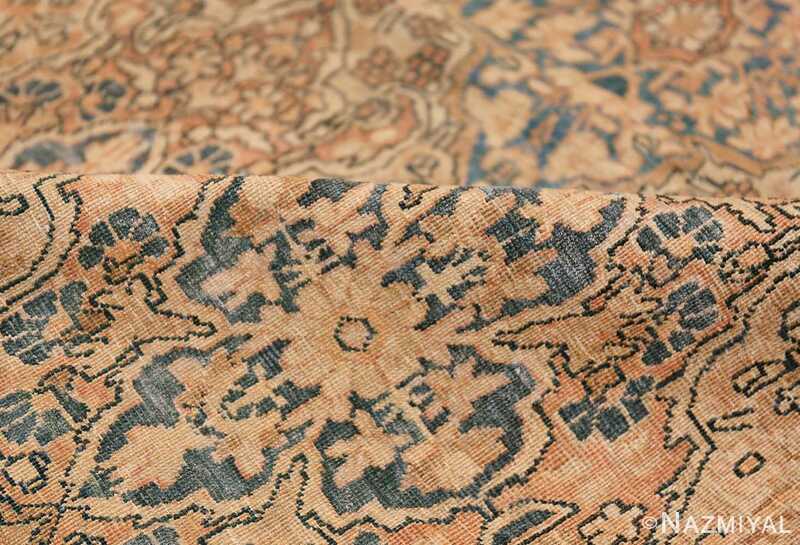 Patterns within patterns reveal themselves as the observer moves closer. In a brilliant display of detail, the flower motif is also incorporated. The individual stitches come together to form an endless maze of imagination and beauty. Though it may seem understated at first glance, this antique room size Persian Kerman rug is an amazing work of art. This outstanding antique Oriental Kerman preserves a classic design from the great era of Persian court carpets.